Most people consider Bournemouth to be a summer location and the perfect place to visit during the warm months. But what if you just relocated there? It is already winter, and you can’t go to the beach or have a long walk in the gardens? In December this charming coastal town transforms into a magical festive place, so there is nothing to worry about. Leave these last boxes unpacked, Christmas is almost here, go and have some fun! To help you in exploring your new town we have made a small list of must visit places all across Bournemouth. We hope you have already unpacked your ice skates because it is time to enjoy some well-deserved fun. Leave the mess of the recent relocation behind, grab your family members and visit the big ice skating rink at Bournemouth’s Lower Gardens. Each year the skating grounds get bigger and bigger, and in 2018 it can hold up to 309 visitors. Decorated with numerous lights and Christmas ornaments the rink is a perfect place to relax and take some family pictures. Something unusual will take place every evening during the Holiday season – the rink will transform into UK’s first ever gliding ice bowling rink. Think of curling and bowling mixt in an exciting new sport. Aren’t you thrilled you moved to Bournemouth just before Christmas? What is the first thing that comes to your mind when thinking about the holidays and alpine styled cabins? A big winter market that is what! It is a Christmas tradition, and Bournemouth can’t be excluded from it. 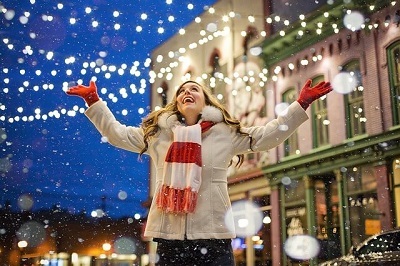 Each winter in the town’s heart a big Christmas market pops up to bring joy in the lives of its inhabitants. The dozens of cabins are decorated with fake frosting, colourful lights and lots of ornaments. The Alpine bar is offering a large variety of holiday drinks, and the many food places will seduce you with delicious smells and tasty snacks. In each festive cabin, you can find a wide range of local craft products and sweets. 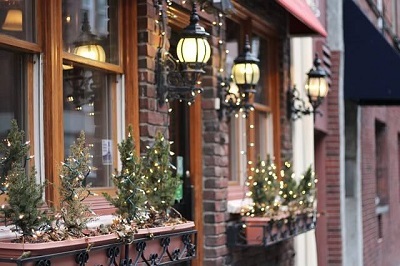 You will definitely forget about all of your worries during the house move after a day at the winter market. Each year more and more venues open doors for their eager visitors. This year for the first time, there is a Christmas tree wonderland in Bournemouth. This magical sparkling spectacle contains over a hundred pine trees covered in coloured lights. You can take a stroll in this glittering forest and fully embrace the Christmas spirit. The trees are located in close proximity to the ice rink and are a perfect romantic ending to an eventful night out with your significant other. The Bournemouth tree wonderland can offer to its visitors regular light shows in the accompaniment of pleasant holiday music. It really does sound like the best place to forget your house moving worries and enjoy yourself. Cheer up your kids by announcing that not only they have moved to Bournemouth, but Santa Claus as well. 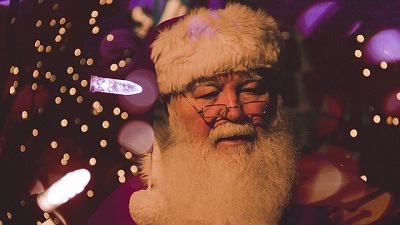 Visit Santa’s Grotto located at the Lower Gardens and take a picture with the good old man. He will be staying in Bournemouth from the 23rd to the 25th of December. Gather the little ones and go say hi. Keep in mind it is best to pre-book tickets in advance to avoid the disappointment of not being able to enter. If you, however, miss this opportunity try at Santa’s Woodland Grotto at Upton Country Park. The smiling Elves will welcome you to Santa’s domains offering to play with you a lot of fun games. Your children can pet the donkeys and reindeer and take part in one of the many interactive games. Organise a fantastic Christmas experience for your whole family in Bournemouth – the best town for a new start!